In today’s world, the use and abuse of alcohol is a topic of great importance. Whether it’s trying to lower underage drinking among high school and college students or decrease drunk driving among adults, it’s clear this topic is at the forefront of many discussions. 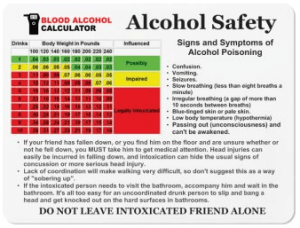 However, to gain a greater understanding of this issue, one has to know the a blood alcohol concentration definition. Also known as BAC, blood alcohol concentration measures the percentage of alcohol in a person’s bloodstream. Used to determine the effects alcohol has on a person’s brain, behavior, and body, it is considered more accurate than basing these factors on the exact amount of alcohol a person has consumed. Throughout the United States, a person is considered legally drunk if their BAC is .08 percent or higher. As these factors combine over the course of several hours, the level of impairment related to the alcohol consumption increases as well. Whether done from a breathalyzer or from a standard blood test, blood alcohol concentration can be calculated very accurately. Expressed as a decimal, such as .05 or .15, the BAC measures the amount of alcohol in the bloodstream by calculating the milligrams of blood per 100 milliliters of blood. Therefore, if a person’s BAC measures .20, it means their blood contains two parts alcohol for every 1,000 parts of blood. According to the Centers for Disease Control and Prevention, blood alcohol concentration can significantly impact a person’s judgment, behavior, physiology, and their ability to operate a motor vehicle or other machinery. For example, if a 150-pound man or woman has two alcoholic drinks in a one-hour period, they will have an altered mood, limited loss of judgment, and become more relaxed, resulting in a BAC of .02 percent. To reach the level of .08 percent, which would make them legally drunk, four alcoholic drinks would have to be consumed within one hour. When this happens, muscle coordination becomes very poor, self-control and reasoning become very impaired, and driving skills such as reaction time, speed control, and difficulty steering quickly deteriorate. If a person continues drinking until their blood alcohol concentration reaches .15 percent, seven or more alcoholic drinks have been consumed. In these cases, vomiting occurs unless the person has built up a tolerance of alcohol, muscle control and balance become virtually non-existent, and the person is basically unable to operate a motor vehicle under any circumstances. Because everyone is different physically and mentally, there are many things to remember regarding blood alcohol concentration. For example, people who drink infrequently will reach a high BAC quicker than those who drink on a regular basis, since their bodies have yet to develop a tolerance for the effects of alcohol. In addition, since alcohol is not absorbed into fatty tissue, people with a higher concentration of body fat will reach higher BAC levels faster than slender people due to the alcohol concentrating in smaller areas of non-fatty tissue. One of the biggest misconceptions regarding drinking alcohol is that there is a major difference in the types of alcohol consumed when it comes to a person’s blood alcohol concentration. In truth, all drinks are considered equal. According to the CDC, a drink equals one-half ounce of alcohol, or about .54 ounces. Whether it’s one ounce of distilled spirits such as gin or vodka, a five-ounce glass of wine, or one 12-ounce beer, the results will be the same when it comes to determining blood alcohol concentration. Does Blood Alcohol Concentration Really Matter? Despite all the evidence regarding the relationship between BAC and alcohol consumption, there are still people who fail to believe it really matters. However, according to the CDC, drivers with BAC levels between .08-.10 percent are 11 times more likely to be involved in a single-vehicle crash. Also, while .08 is the legal limit for being considered drunk in the United States, law enforcement officers do have the authority to arrest those drivers who have lower BAC levels if the officer has probable cause based on the driver’s behavior. While there are many factors that play a role in determining a person’s blood alcohol concentration, there is no doubt that a strong correlation exists between the number of drinks consumed and the subsequent physical and mental behavior. By having a greater understanding of BAC, perhaps alcohol-related incidents will decrease in the years ahead.